The bad news – 1. Massie’s style is suitable for a 5th or 6th grader. 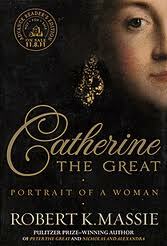 For the most part, Catherine the Great does not “read like a novel,” but rather like a regular old-fashioned biography – that’s neither good nor bad, but it’s not so hot if it makes the book read like a regular biography for elementary students – but it’s just too long for them – and some of the content may not be suitable. 2. The source notes are as limited as I suppose it’s possible to make them – I’d give this part an 11th grade effort. I don’t mind that they’re all in the back – that’s the new way and it has it’s advantages – the fact that they are only abbreviated indications of where he found the material is sad and worse is that he doesn’t give a referral to a note within the text itself. The notes are page numbers (for the text) and sources with pages numbers. That’s it. Makes it difficult on the reader who wants a bit more. 3. It feels like Massie is infatuated with Catherine – there’s very little fault found with her or her views. Where she erred he explains. 3. Overall the book generally feels like it was slapped together as quickly as possible. The good news (yes, there is good news) the story of Catherine II is pretty interesting. At first it seemed like it was all family difficulties and romance and tension over who when and how would she get married, take lovers, get crowned, have babies, and what was going on with Peter III (her husband) who had some serious mental issues and how would that turn out and so on. Those were “page-turner” type events and even without Massie contributing anything to the suspense, it’s there. The structure of the book is excellent – Massie never gets so carried away on one aspect that getting back to others is a reverse time of substantial years. I feel much more like I’m “witnessing history” when an author does this. The education of Catherine via Diderot and Voltaire was pretty interesting but I wish there’d been more. Catherine’s Enlightenment-oriented development of the Nazak, an idealistic set of goals for the development of Russian government and law. The convention (parliament type group) Catherine convened to attempt self-rule. A total failure but it was interesting to see how. The foreign relations part was pretty boring except for Poland’s boyar system – heh – but I had prior knowledge of that. The smallpox and vaccination episode was fascinating as was the associated part about the Bubonic Plague. The sections on Pugachev’s Revolt was wonderful as well as being well organized and written. I’d only read bits about that prior to the book. Massie is almost distinctly not sympathetic. The bit about the French sculptor who created the statue of Peter I was interesting but I don’t think a history of the French Revolution was necessary. Overall – a worthwhile but not an important read.